The first pieces of fine art pottery from Moorcroft were launched into the world in 1897. Designed by William Moorcroft, a graduate of what is now the Royal College of Art in London, the new art pottery was purchased strongly from the outset by such prestigious stores as Liberty of London, Harrods and Tiffany & Co. in New York. Early Moorcroft is much-prized by the most renowned auction houses across the world and regularly fetches high prices. Happily, this is still a feature of Moorcroft today where the art pottery’s reputation for both remarkable artistic and good investment qualities have been proven over more than a century. 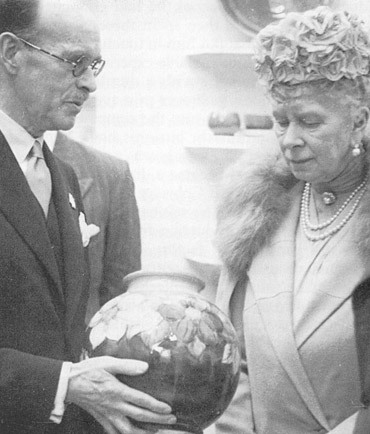 In 1928, after winning many gold medals and prestigious international awards, Moorcroft was appointed ‘Potters to H. M. The Queen’ an honour which William proudly accepted on behalf of his company. 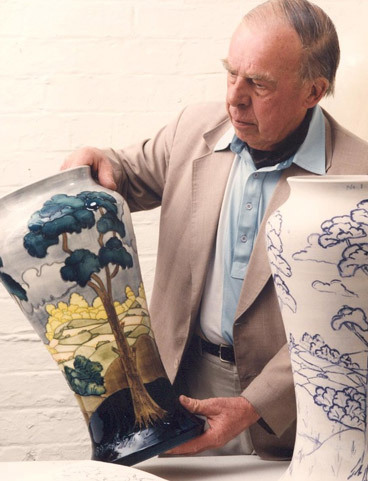 In 1913, with the aid of substantial funds from Liberty, William was able to move production of his art pottery to the present factory in Sandbach Road under the name of W. Moorcroft Ltd.
Walter Moorcroft assumed the responsibilities of sole Moorcroft designer in 1945. Design continued to evolve under the stewardship of Walter, as he developed his own style which experts say matured in the 1950s. It was Walter who introduced many exotic flowers into Moorcroft design. A dramatic use of colour began to emerge from the Moorcroft kilns after WWII, and coming as they did in the wake of the sombre mood of war, this was a welcome change. It was in 1986 that Sally Tuffin took over design. Aided by Phillip Richardson, she introduced animals, birds and geometric patterns into the vision of Moorcroft art. 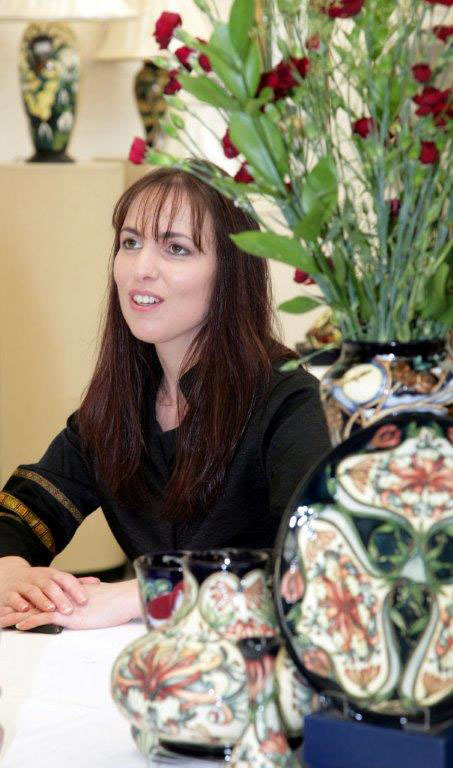 From 1993 until 1997, design at Moorcroft was created solely by the skilled hands of ceramic graduate, Rachel Bishop. Rachel continued to enhance the international reputation of Moorcroft, building strongly on the work of her predecessors. 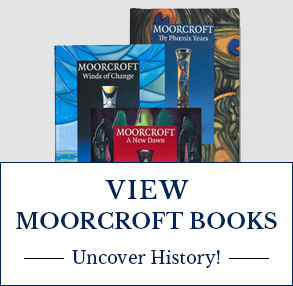 In 1997, the Moorcroft Design Studio was formed which rapidly added strength to the Moorcroft name as a result of their broadly-based design ideas and artistic vision. Today, the Design Studio comprises five world-class ceramic designers who have moved design forward to the centre of the international stage in the theatre of the applied arts. Many hundreds of designs have been created and developed since their arrival, adding a powerful impetus to the evolution of design at Moorcroft. Today Her Majesty, Queen Elizabeth II still regularly takes new Moorcroft designs into the Royal Collection to this day - something about which Moorcroft is justifiably proud. 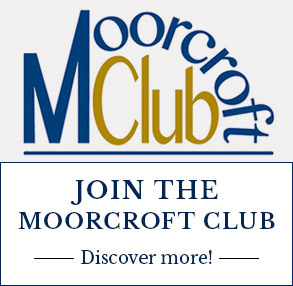 Such is the reputation of Moorcroft, that many other celebrated people have taken Moorcroft into their homes including Leonard A Lauder, President of the Estée Lauder cosmetics empire, and a man who has one of the largest Moorcroft collections in the world: former US Presidents and British Prime Ministers, famous actors and singers. The quality of Moorcroft design and the artistic skills of its workforce means that more than 100 years later, the company is still supplying Liberty of London and today Moorcroft is sold worldwide to an international audience, bring a kaleidoscope of colour to the world. designconsort emerged as an independent entity in 2017. 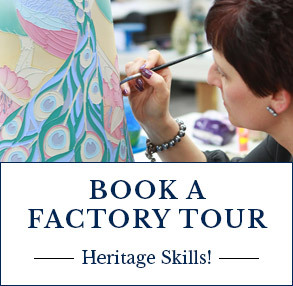 With a formidable team of creative designers, designconsort has a depth of handmade ceramic expertise backed up by a wealth of heritage skills from master craftsmen and women. Each piece of designconsort is made in the same way as traditional Moorcroft, but on utterly contemporary shapes. Many designs also use delicate amounts of gold and silver lustre within designconsort’s trademark abstract and geometric designs.